Titanium offers similar strength of steel but is two times lighter and offers a amazing corrosion resistance. Grade 1 is the most pure type and is mostly welded with Grade 2 filler metal. The weldabillity of Titanium is excellent for most grades but extra care have to be taken for the gas protection on the weld pool, the weld pool needs to stay protected until it cooled down to at least 470ºC. Often Titanium is welded in a gas chamber with pure argon gas to make sure that the weld pool gets proper protection. 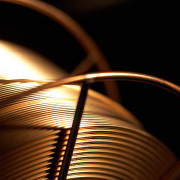 We stock all Titanium grades in Mig and Tig wires witch can be found in our database.